iPhone 6 (Plus) vs Samsung Galaxy S5: Which is the Better Device? In no more than ten days, a new smartphone from Apple, with iPhone 6/iPhone 6 Plus designation, will join in the pool of smartphones for customers to choose. However, the fact that choice is good doesn't necessarily mean that more choice is better. 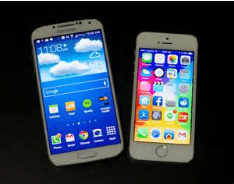 As two mobile phone giants on the market nowadays, the newly released iPhone 6 (Plus) and Samsung Galaxy S5 inevitably lead most customers into the dilemma when decide which one will be the better buy. Both phones come in similar features with specific details out of each other's league. To make this tough task easier, here we make a detailed comparison of iPhone 6/6+ vs Galaxy S5 specs. For users who want a device with larger display, look no further than Samsung Galaxy as Android has stayed ahead of Apple in the aspect of bigger display for a long time, particularly as evidenced by its newest Galaxy S5 which comes with a dazzling 5.1-inch display. However, Apple has taken a major leap from a 4-inch screen to both 4.7-inch and 5.5-inch display. Of course, the size increase will come along with an increase in the overall size of the phone compared with iPhone 5S, but it is still more compact when the small version compared to galaxy s5 and larger iPhone 6/6+ to Galaxy Note 4. Apple pushes its 64-bit architecture to iPhone 6 (Plus) and power it with a 2GHz dual-core 20nm A8 processor while Samsung Galaxy S5 runs on a 2.5GHz quad-core Krait 400 CPU. Generally speaking, quad-core processor is more powerful than a dual core. However, in view of the fact that the iPhone 5s running on a 1.3 GHz dual-core Apple A7 chip seems to be comparable with Galaxy S5 in most benchmarks, if not superior, the iPhone 6 may blow the Galaxy S5 out of the water. A new operating system called iOS 8 which was introduced at WWDC 2014 is shipped with the new iPhone 6 and iPhone 6 Plus. This new iOS 8 brings some charming characteristics like number of health and fitness features based on location technology. For example, the operating system may handle lots of fitness and health data to help determine user speed, distance, steps etc. Samsung Galaxy S5 runs in the latest version of Android KitKat operating system. Along with the Health fitness tracker which delivers the same awesome performance, Galaxy S5 is also able to measure user's heart rate on with a heart rate sensor. Samsung Galaxy S5 have two variants of internal storage 16 and 32 GB, both of which can be expanded up to 128 GB using a micro SD card while the largest capacity of iPhone 6/6 Plus bumps up to 128 GB. The large storage and expandable capacity make both phones good devices to watch videos and you can just use a proper video convert to transfer some videos to Galaxy or iPhone 6 supported formats. The battery life decides the time you can play and make phone call. It's really annoying when you want to play games but the phone keeps prompting low power. Rumors indicate that a battery with a capacity between 1,700mAh and 2,000mAh will be provided in iPhone 6. Samsung Galaxy S5 is more powerful at 2,800mAh, which should be enough even for its high-end hardware and can run for 21 hours of talk-time according to Samsung. However, the difference in battery size dose not mean everything. Thanks to the new processor and other improvements, iPhones always deliver high-quality battery life that could be on par with Samsung phones. iPhone 6 this time comes with a new 8-megapixel main camera, but the up-to-date dedicated camera chip is also accompanied, while Samsung Galaxy S5 is well ahead of iPhone's megapixels with a 16-megapixel camera sensors. Summary: From the above review of iPhone 6 vs galaxy s5 phone we can see, both the two phones are top of smartphones similar in what they offer. Surely technical capabilities of the Galaxy S5 are amazing and it's really a no-brainer if you don't want to wait. However, it's hard to tell which is the winner of the Samsung Galaxy S5 vs iPhone 6 war until Apple's iPhone 6 brings all its innovations. Here our suggestion is to wait and choose the top-notch one. By the way, the price of Samsung S5 certainly will be much cheaper when the iPhone 6 arrives on shelves. Maybe you have to wait for another month to make sure which one to buy, but one thing for sure is, both phones are in big screen, high resolutions, long battery life, large storage capability, making them ideal devices to enjoy videos, especially the ones in HD formats, like UHD 4K videos or Blu-ray DVDs. In view of the format incompatibility, tools you may need to smoothly enjoy videos on them. If you have already stored tons of videos and want to transfer them to iPhone 6 or Samsung Galaxy S5, MacX Video Converter Pro can help you with this task. Built in 400+ video & audio codecs, the video converter for Mac can convert all HD videos, standard videos, online YouTube videos like MOV, FLV, AVCHD, MTS etc to both iPhone 6 and Samsung video formats with high quality. If you want to watch DVD on iPhone 6/6+ or Galaxy S5, here MacX DVD Ripper Pro is just the one you can rely on. This DVD ripper is capable of copying DVDs, including those protected by the latest DVD protections like DVD CSS, region code, RCE, Sony ArccOS, UOPs, Disney, etc to MP4, MOV, M4V, AVI, H.264 and other various popular video formats for playback on iPhone 6 (Plus), Galaxy S5, other Apple and Android devices in excellent quality.